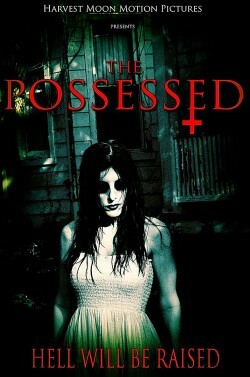 Your upcoming movie The Possessed - what is it about, and what can you tell us about your character in it? "A supernatural thriller set in New Orleans, The Possessed focuses on the story of Ruby Blackwood, a stunning, yet sardonic private detective who holds a dark secret." How do you prepare for your role, and to what extent do you identify with the character of a sardonic private eye? I am tackling this as I do any role, with research, inspiration and an active imagination. I have to identify at least a bit with every character I portray. It's what makes them all human and relatable. I also try to watch films and shows with the same type of subject matter to inspire me. How did you first get involved with the project, and how did you end up on the production side of things as well? I was approached by the director about this character, and I've assisted before with a few castings and such so I was asked to be an associate producer. You have worked with The Possessed's director Shawn Anthony quite a few times before - so what can you tell us about him and your previous collaborations? And how did you first meet, even? I met Shawn years ago and we worked together touring in stage magic - he was a professional illusionist and I was looking for work in the performing arts, it just kind of happened. I also was a fan of magic but my original love for acting outweighed my love for stage magic (I was an assistant and an escape artist for a few years but that also can take its toll physically on a person) so I went back to my first love, which was acting in theatre at the time. So I started focusing on film after taking a class, and during that time, Shawn wrote me and told me he was tackling a screenplay called Soulmate and wrote to me about it. I read for him and he loved my read, so that was the start to working with him. That still is my fav role to date for film. It's out on Vimeo. I also had a blast doing other feature films as well as two short films called The Price and Bloodloss (another favorite character of mine where I played a vampire trying to become human again). We've been friends and collaborators since. He's become quite a phenomenal writer, director, and cinematographer since then. I enjoy working with him. He's subtle and writes female characters really well. They are strong and full of subtext. I look for that in any screenplay I'm considering. 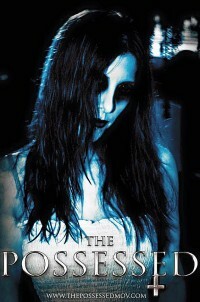 So any idea when The Possessed might go into production? Another film of yours that's about to premiere is Laid to Rest - so what's that one about, and who do you play? 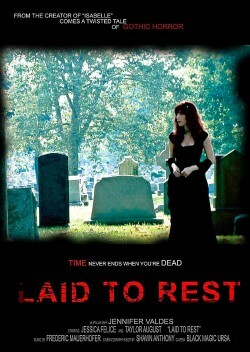 Laid to Rest is about a ghost who is caught in limbo from an untimely death. I play "Jessie" who is a restless spirit caught in limbo. What did you even draw upon to play a ghost? I was inspired by more of the "life" part than death - how precious it is and how quickly it can go by. How we can lose everything in the blink of an eye. I focused on dysfuntional relationships and the typical patterns to them, as well more of the heart of who Jessie was. I also focused on what love is to different people and how it may affect them. Loneliness and fear of loss. Fear in general. What is the worst thing that can happen to a person. They are alone. Some people also fear monotony and living the same life and patterns over and over again. Sometimes I believe people go through that until they learn from those patterns and can move on from that static feeling of limbo.To me this was more of a drama than a horror but definitely had undertones of gothic horror which you will see in the film when the outcome of her situation is discovered. Do talk about your director Jennifer Valdes, and your collaboration with her! Jenn has an artist's heart and a gothic vision when it comes to her screenplays. I loved her ideas which she purveyed in her script for Laid to Rest. She also is a very sweet person and I'm so happy I had the opportunity to work with her as I'd been wanting to for a few years. She and I seemed to be on the same page for my character. If I had questions she was very quick to respond to them. Collaborating with her was a lot of fun. It was a lot of fun with some really great people who love what they do simply put. I've even kept in touch with several of the lovely people I met. Who knows maybe I'll collaborate with them again in the future. Either way I've made some friends for life. Currently I'm waiting as said to film The Possessed, which will be the most challenging project I'll have worked on to date for multiple reasons. It's just an all around larger scale production with a really incredible cast and crew assembled as well as a killer script. 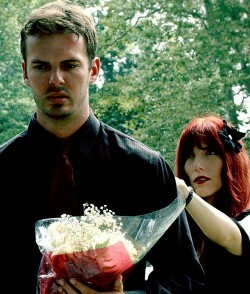 I also have other feature film projects coming out this year such as The Haunted where I play Katherine Blackwood. Then I'm supposed to be filming 315 Wicked Way in the role of "Siren", and Twincarnation as the Aksos Twins, and continuing Tales of Horror as the show's host Lilith Death, which is an anthology of short horror films on Vimeo. I do have other projects but I am afraid I am not yet allowed to discuss them. Both feature films and short films and am also in talks for several projects as well. I will post info on my website as it's released. On another note, I did some voiceover work recently including Red Brew, a short story that can be found on my website, as well as for Camcorder TV called I Am the One Who Screams. I love voice over work as well, almost as much as film work. But I'm always looking for inspiring work that challenges me in new ways as an artist and that I find relatable. 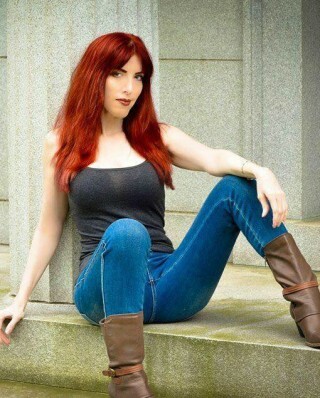 I occasionally do some modeling for cosplay, magazines, couture, and novel covers. That's always fun and a totally different type of art. But I love them all. I've loved acting since I was a kid. Probably around the age of 5 when I did Cinderella in camp, lol. My dad was very much into acting and broadcasting and he introduced me to the world of theatre and film, so my love of the craft comes from him honestly. He even also had a degree in it. But yes I have I started training when I was about 13-18 with other kids at a professional studio, and during that time in high school I was in plays every year, did some community theatre, took drama class each year, and was head of the drama club for a bit. Following that, I received an honorable mention for MD Distinguished Scholars in Acting. Then I earned a small scholarship in college for acting as well. After which I went on to earn a BA in Theatre. Once I was finished I toured professionally with several companies, did dinner theatre, summer stock, and some semi professional work and after for a few years did some touring stage magic as mentioned as well as performed in Las Vegas for a Halloween season. Once this started to settle down, I decided to take a class for acting for the camera. The film bug got me and here I am. I was thrilled to have won 2 Awards for my portrayal of Katie Stephens in Soulmate at 2 different festivals, WMIFF and HMIFF. During college, I discovered voice-over work as well. Since then, I've tackled character work to video games to industrial work and narration. Honestly though much of my training is from experience and learning from being on stage or on a set. Nothing really prepares you for that until you actually do it. I never put down anyone for not studying but some of the work I did in school did help too and I'll always be eternally grateful to those teachers who gave me that education and discipline, and while I am a believer in honing one's craft, I believe also that either it's there in the person already or it's not. All of this experience certainly gave me a well needed appreciation for this artform. It's all I've ever wanted to do. What can you tell us about your filmwork prior to Laid to Rest and The Possessed? Going through your filmography, one can't but notice that you've been in quite a few horror movies - at all a genre dear to you, and why (not)? Well as I mentioned above they just seem to find me. Sometimes I audition and sometimes people have been known to reach out and show me their scripts where a character seems to fit my description and ability as they perceive it. I am a huge fan of fantasy and sci fi and of course supernatural thrillers. But I never rule a project out by genre, I just go to what calls to me which is not ever set in stone. I take on each project individually so there is no real singular method. Some are more realistic and some have more of an artistic or macabre flare to them but I always try to find the best way to humanize these characters. I'm a very internal actor. Sometimes I work on specific physicalities with the body to mark how a character starts off. They have certain ticks etc that make them who they are. Or it's more internal than that. I use personal experience to mold how they grow or react. I've studied multiple techniques, and methods in school and workshops, as well as movements. Laban and Alexander etc. I tend to do a lot of mirror work when it comes to the more intense work for scenes etc, and I watch others work for inspiration sometimes, or I even will listen to music for inspiration. I also have a strict habit of warmups to help me loosen up vocally and phsyically for every project I do. I probably sound like a nut to the average joe but there are many actors out there who I'm sure have their bizarre seeming routines. I just go where I can as far as I can to the best of my ability. And I always give 110% on every project I work on. I can't accept less. Hmm, well I've been asked this question multiple times and it really hasn't changed much. Helena Bohnam Carter, Eva Green (her work on Penny Dreadful is awe inspiring), Cate Blanchett, Jessica Lange, Vera Farmiga , and many others. I'm also hugely inspired by Anthony Hopkins, Morgan Freeman, and Johnny Depp. All of these actors have intensely inspired me at one point or another. Wow there are way too many to list! But offhand I can list a few... I'd say Labyrinth (fav when I was a little girl), Edward Scissorhands, Big Fish, Rent, Lord of the Rings ... so many ... I think I'm caught more on some T series now than films though - Penny Dreadful, The OA, Sense8, Buffy the Vampire Slayer, Charmed, Stranger Things, Black Sails, Da Vinci's Demons, WestWorld, True Blood... some of the best acting right now is on TV! All of these are so good!! !